M. Saravanakumar, M. B. Adhithya Mannan, R. Vinothini and M. Gurusamy. "Design and Implementation of Sensor less BLDC Motor Drive." International Journal for Scientific Research and Development 7.2 (2019): 492-494. S. V. Shelke, Biradar Abhishek Somanna, Jadhav Anil Vijaykumar, Borude Swapnil Tulsiram and Bait Nagesh Raghunath. "Design and Fabrication of Papad Rolling Machine." International Journal for Scientific Research and Development 7.2 (2019): 495-496. Nihal Shaikh, Affreen Belim, Sneha Mishra, Swati Maurya and Rajesh Gaikwad. "Achieving Abysmal Security for Multimedia Data using H.264/AVC Algorithm." International Journal for Scientific Research and Development 7.2 (2019): 497-499. Ms. Nikita Nanaware and Dr. N. V. Khadake. "Assessment on Jalyukt Shivar Abhiyan- A Case Study @ Ranzani Village, Tal-Pandharpur." International Journal for Scientific Research and Development 7.2 (2019): 500-502. Vishal J. Pawar and Snehal Raut. "Influence of Elevated Temperature on Concrete with Partial Replacement of Cement by Ground Granulated Blast Furnace Slag." International Journal for Scientific Research and Development 7.2 (2019): 503-507. Shubham Patil, Akshay Ingale, Pradeep Ranher and Purushottam Mahakal. "Detect Fake Identities of Bots vs Human using Machine Learning." International Journal for Scientific Research and Development 7.2 (2019): 508-509. Alok Baghel, Aditi Singh, Pooja Kumari, Charu Sisoudia and Ashish Kr. Singh. "Society Harnessing Equipment." International Journal for Scientific Research and Development 7.2 (2019): 510-512. K. Saraswathi. "Internet of Things (IoT) Based Industrial Automation System: A Survey." 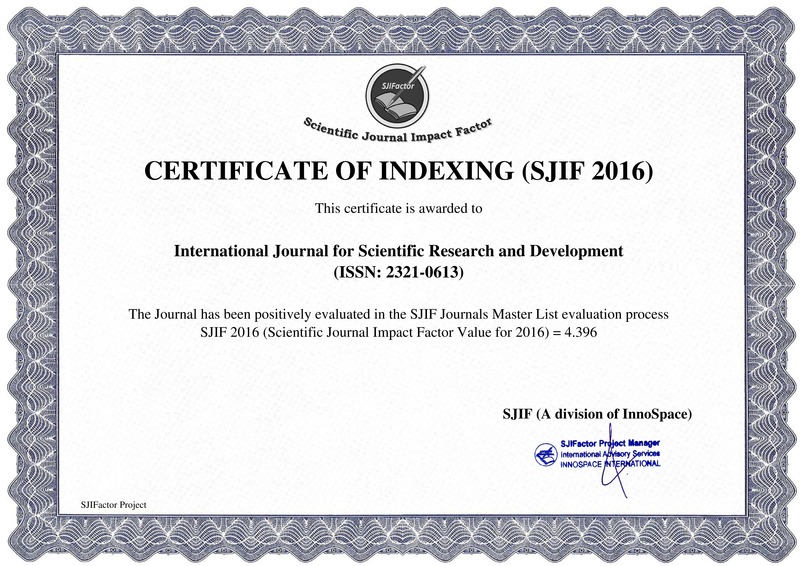 International Journal for Scientific Research and Development 7.2 (2019): 513-515. K. Saraswathi. "Industrial Automation using IoT: A Review." International Journal for Scientific Research and Development 7.2 (2019): 516-518. Kirtankumar Manasukhlal Katharotiya and Jitendra Patel. "Analyzing the Cost Benefits of Value Engineering in Construction Project by Replacing Material." International Journal for Scientific Research and Development 7.2 (2019): 519-521.